It only lacked of a lamp. There was a ceiling light mounted on the fan, but it was poor. When it was lit, the whole interior was (darkly) lit, which enhances the tininess of the space. As a home, we felt it should be more intimate and warm. Lighting had to go lower. We got to get a new lamp. 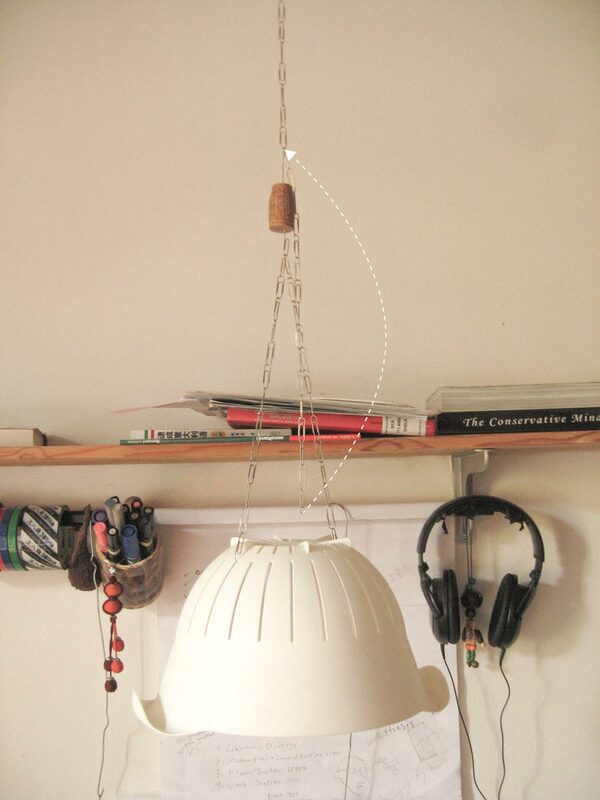 And here is the result: Lampstand from IKEA, classic and cheap (you may have one too); lampshade from IKEA too — FLÄCKIG white plastic colander, hanged by a string of paper clip, cork, from a sliding system made with steel wire and push pins mounted on the old house’s wooden beam. It completely improved our life. 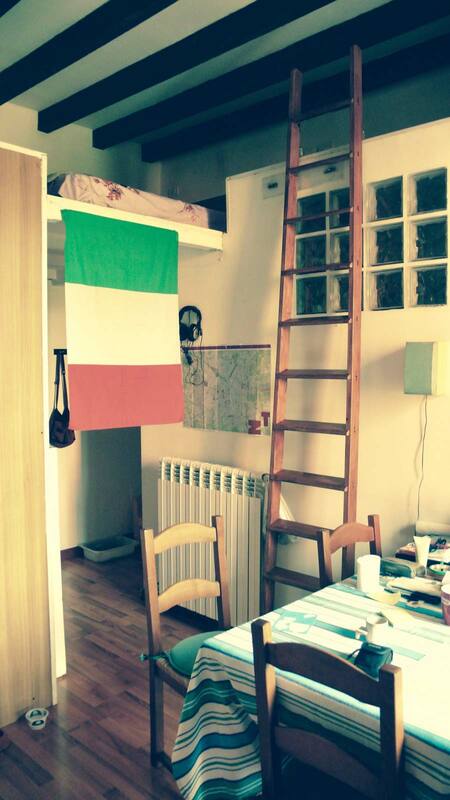 We used it for two years from moved in till leaving Milan. We named it Lamp A. Why it looks like this? Here’s the story. As talked above, we were in need of a lower lamp. Of course we went to IKEA without thinking. 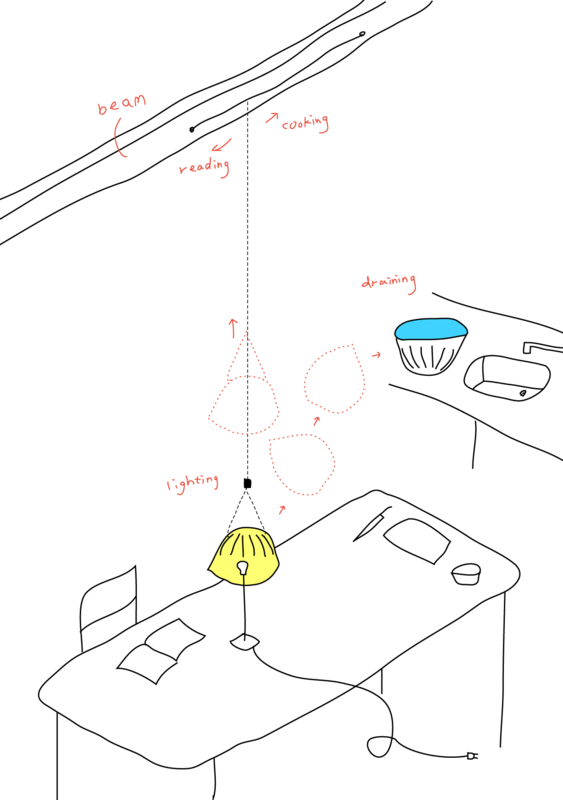 By looking around in IKEA, we got a lampstand with bargain price but didn’t find a good lampshade since they were all surprisingly expensive. 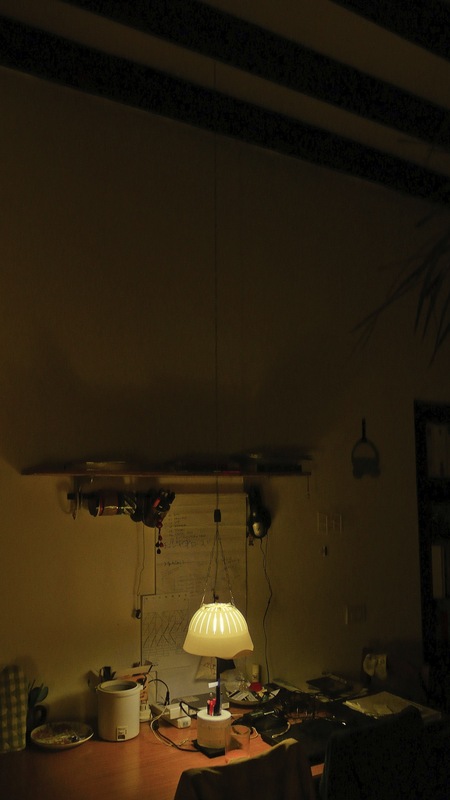 So we wanted to make a lampshade. 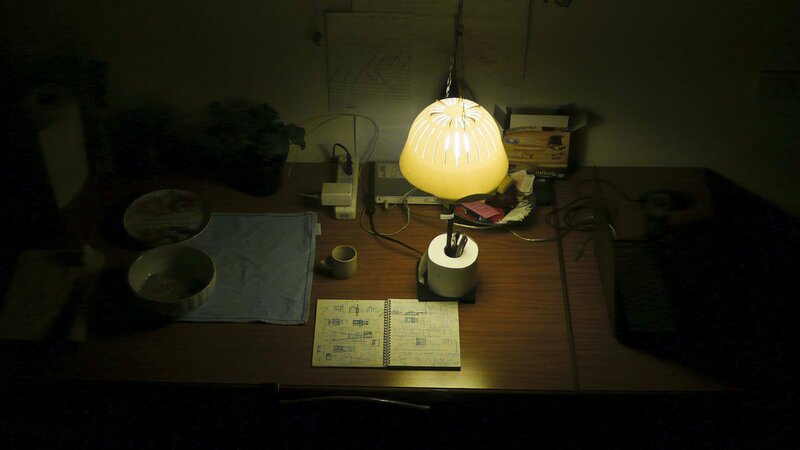 Soon, we got several ideas, tried and failed, neither too weak the structure — you know we have a cat — nor too dim the light. After dozens of failure, all of sudden, we both fixed our eyes on our colander, also from IKEA, bought together with the lampstand. Look, the colander has the same shape as a shade. The material is translucent. Evenly distributed gaps for draining can surely let light go through as well. It proved to be a good try. The light was gentle but bright enough. 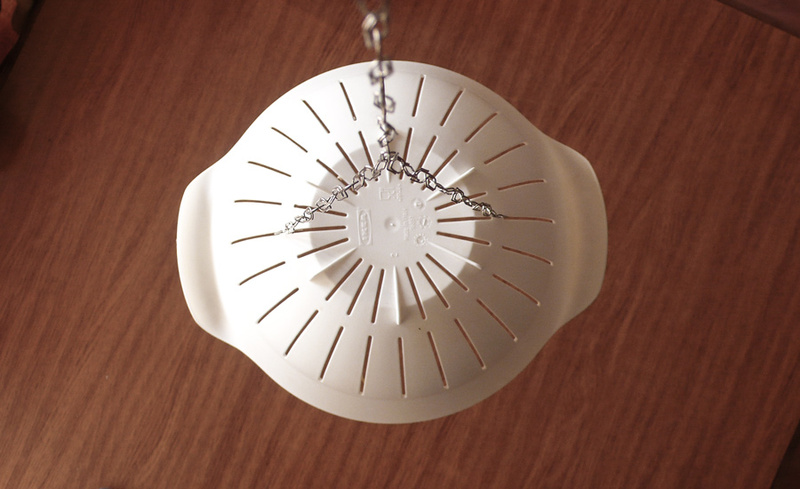 Moreover, the time of using colander to cook and to shade the light is crossed. We don’t use colander to drain things for long, and not every meal needs it. 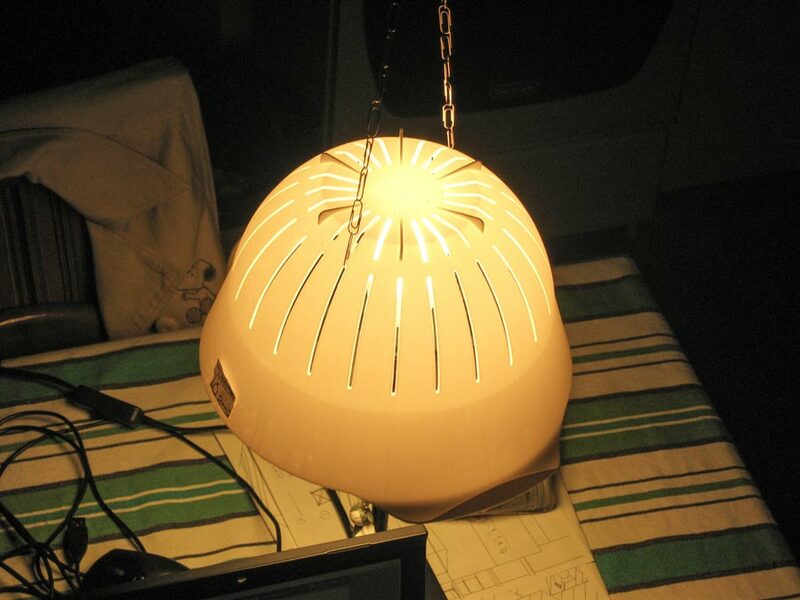 For the period of being left there doing nothing (the most popular activity in colander world), colander can be a absolutely used as a lampshade. The table we got in that tiny apartment was inpproptionally big. It occupied the central space of the interior, having stove and sink on one side, wardrobe and bookshelf on the other side. It meant to host different activities, if not all. Primarily, preparing food and working would take place on each sides of its long edge. 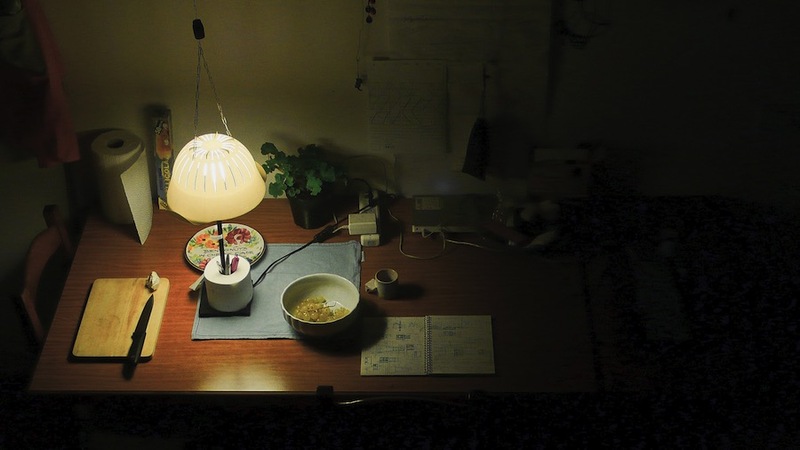 Light played an important role in both cutting and writing. 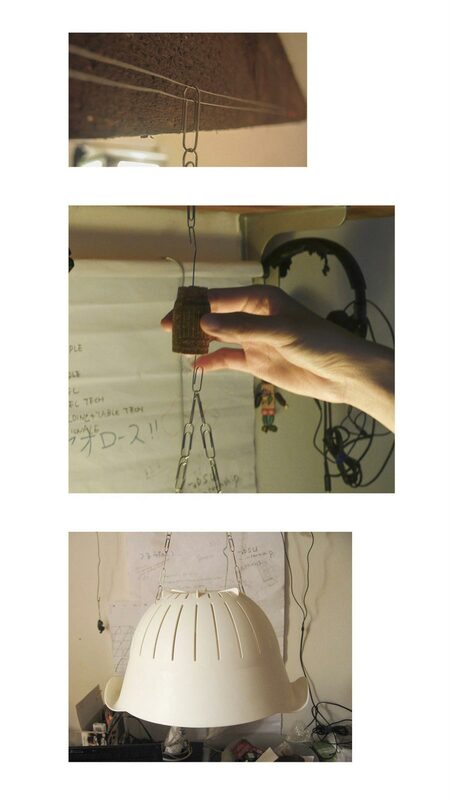 Therefore, we had to make a movable lamp. We improvised a sliding track. The track was made of steel wire, which was straightened by two pushpins. 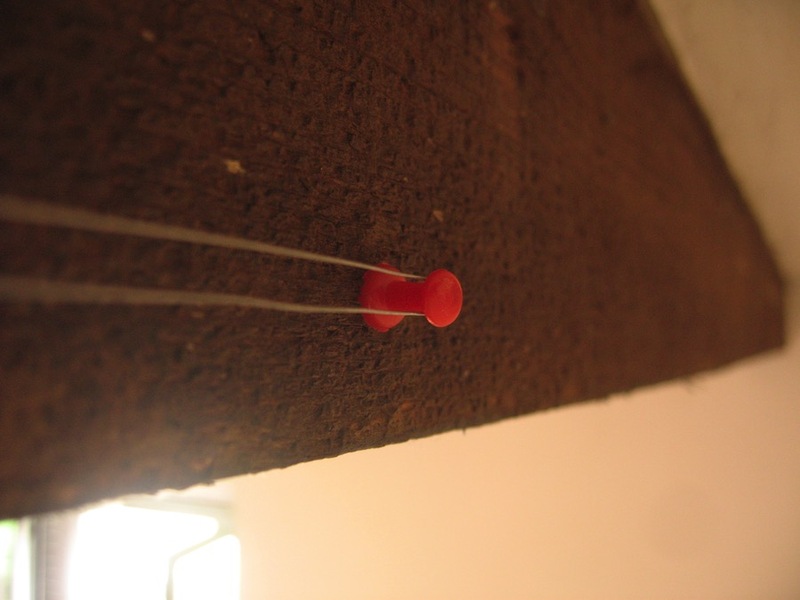 The pushpins were fixed on a wooden beam. Thank goodness we got wooden beams (easy to work with) and they were placed evenly across the whole space. Having a shade and a track in hand, we had to work out a connecting way. 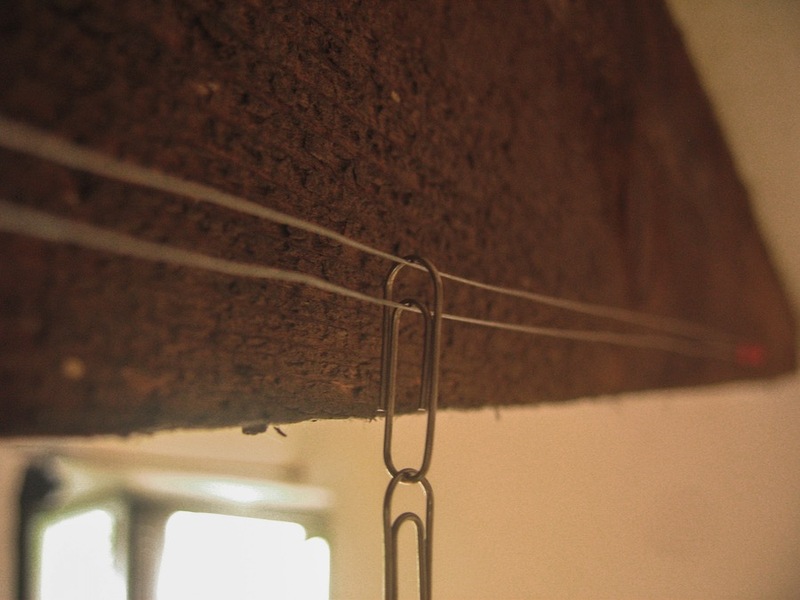 Looking at the wooden beams on the ceiling, we thought it could be hanged with something like a rope. Gaps are ideal hooking points because they are symmetrical. We could hang it flat. We used clips for our hanging system. Why clips? First of all, we had thousands of them. We had brought them from China for making model in POLIMI, following the fashion that students studying overseas prepare stationary stuffs as many as possible to avoid spending more money on buying the exactly same thing there (yes that was stupid). 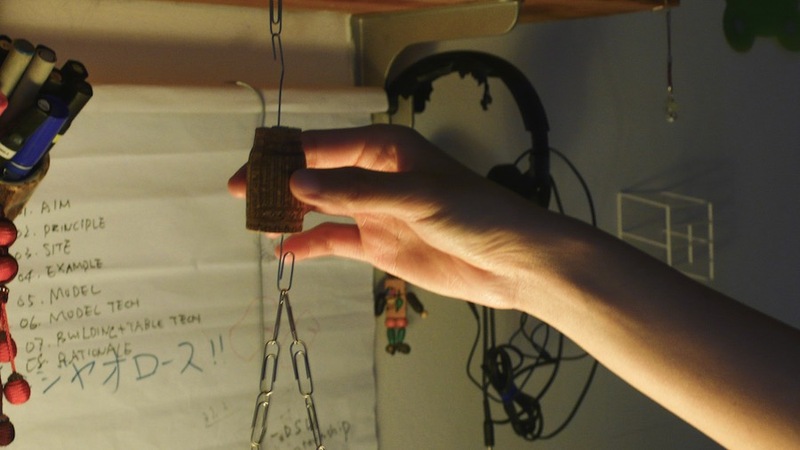 We felt happy to justify an old irrational action by using them more often and purposely. 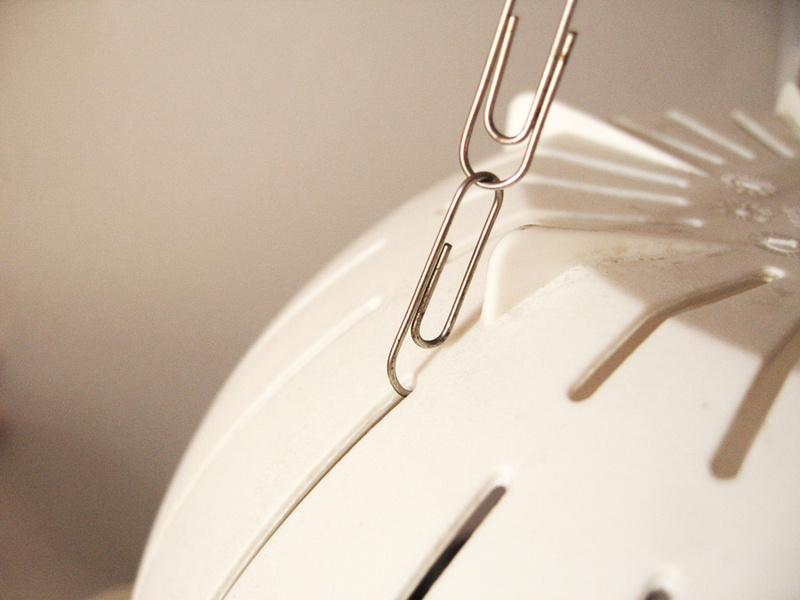 Secondly but most importantly, clips can be connected with one another so easily to form a chain, and the chain got a lot of anchor points. This enabled the lampshade to move in vertical direction. In addition, we made the moving process more pleasant by adding a hand-friendly cork. Lastly, we could achieve all the above comfortably by hands, making the whole project so workable as we didn’t have any meaningful tool at that moment (not even now…). Lamp A looks strange but every single detail had a reason. And it works.